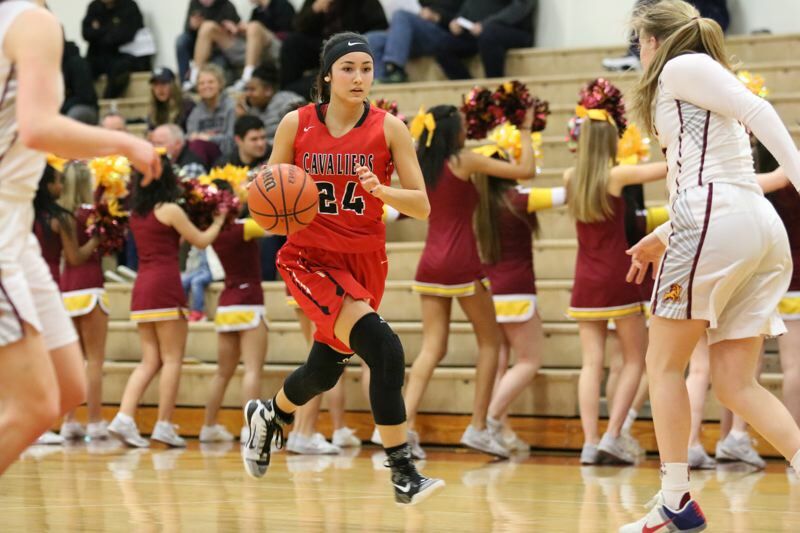 Sometime near the end of the 2017-18 high school basketball season, Clackamas junior guard Alyson Miura decided she needed to make a change for her senior year. That meant transferring somewhere, and somewhere turned out to be La Salle Catholic College Preparatory. Miura, one of the state's top college prospects in the Class of 2019, saw the private school in Milwaukie as a place where she could grow both academically and athletically before taking her game to the next level. She also liked the idea of reuniting with Falcons coach Kelli Wedin, her former youth coach who helped transform La Salle Prep into a perennial Class 5A powerhouse. Miura talked over the decision with her parents and then started making arrangements to join the Falcons for the start of spring workouts while finishing up her classes at Clackamas. "The first week, it was already just so great, and I've had so much fun," Miura said. "The girls are all amazing and super-welcoming, and the whole coaching staff ... everyone is just great, so it's been really fun here. "Honestly, it's just a better fit here for me and more my style, I would say." Miura didn't say anything negative about the Clackamas program and emphasized that the decision to switch schools was her idea. "It definitely was my decision," Miura said. "I mean, my parents will support me no matter what, but if I really didn't want to do this, my parents wouldn't have pushed me to do it. "I just kind of wanted to end my senior year on a good note and have fun and get prepared for college, and I know Kelli can help me do that." So, had the game stopped being fun at Clackamas? "You know, it's not that I wasn't having fun there," she said. "I really just don't want to go into that stuff. I've kind of moved on, and this has been great and I just want to keep going in that direction and just look forward." Miura was named to the Mt. Hood Conference's all-league first team and earned Class 6A All-State honorable mention in each of her first three seasons at Clackamas, including a junior season that was cut short by a broken bone in her shooting hand. The 5-foot-9 guard is as comfortable running the point as she is playing on the wing and is a force at both ends of the floor. ProspectsNation.com rates her as the 124th top college prospect overall and the 32nd top guard prospect in the Class of 2019, noting that she plays aggressive, changes speeds well, and "has a poise about her that gives her moves an all-around smoothness." 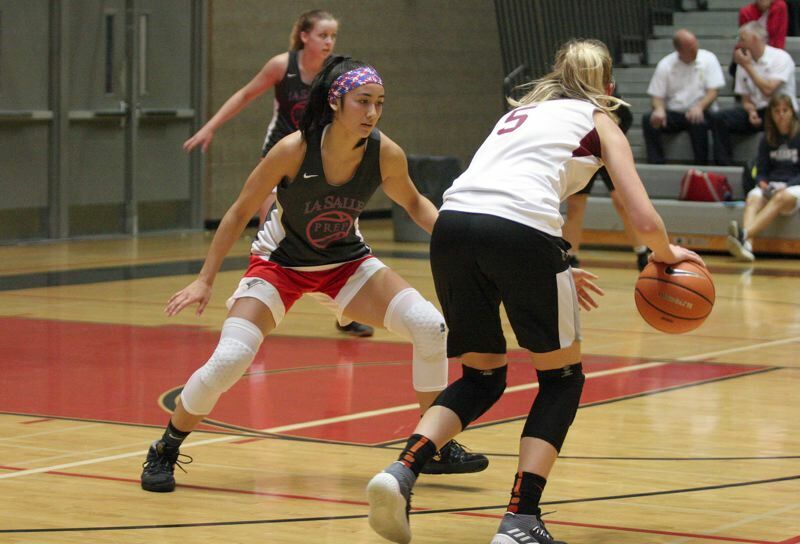 She has 11 offers from NCAA Division I schools and is hoping to draw the attention of other college recruiters this summer while playing on the AAU circuit with the Cal Stars traveling team. 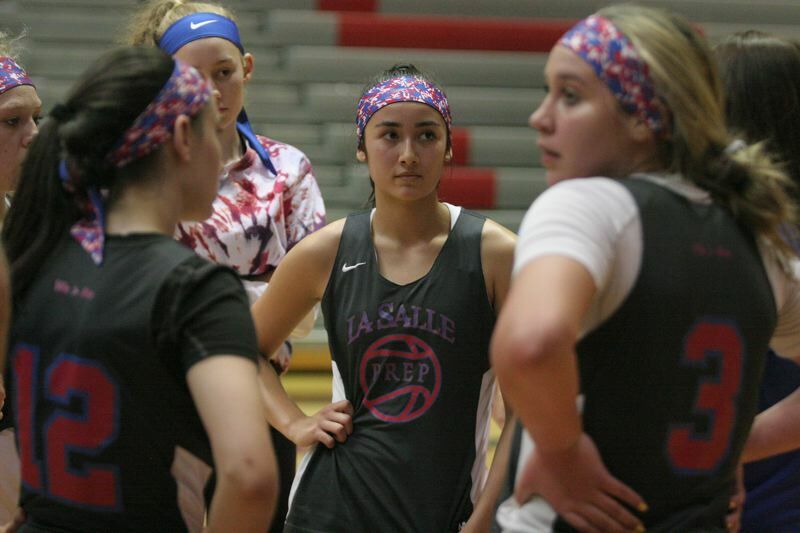 For now, though, she's getting a crash course in La Salle Prep girls' basketball. "We have a lot of guards and we're all sort of moving around," Miura said. "My role here is a lot of point guard, so far, at least. But Kelli runs a bunch of plays, too, so I get a lot of shots off. It's not like I'm just initiating the offense, so it's a lot of fun." Wedin, beginning her seventh season as coach of the Falcons, is thrilled to have Miura in the mix. "It's fantastic, Wedin said. "When I was told that this was happening and she was transferring, it was a big deal. Her skill set is just tremendous, obviously. She's really explosive, she's a great kid, and I had the pleasure of coaching her growing up. "The girls understand like, 'Yeah, Alyson is coming to play with us, but she's going to make us better and we're going to make her better.' That's kind of how we operate and I think she understands that this is going to be a really good fit for her, and I think our girls really understand that ultimately she's going to help us try and achieve our goals." In six seasons under Wedin, the Falcons have won two state championships in 2015 and 2017, and made two other state finals appearances in 2014 and 2018. They also have yet to lose a league game with Wedin on the bench, compiling a perfect 80-0 record, including a 20-0 mark in two seasons as a member of the 4A Tri-Valley Conference and 60-0 over the past four seasons in the 5A Northwest Oregon Conference. La Salle graduated five seniors, including Class 5A Player of the Year Taycee Wedin, the coach's daughter, from last year's state runner-up team, leaving one obvious hole in the Falcons' lineup — a hole that Miura will most certainly help fill. In Friday's opening game of the Les Schwab Northwest Championship tournament, Miura scored 11 of her game-high 21 points in the first half and finished with five three-pointers, leading the Falcons to a 59-38 win over Tualatin at Oregon City High School. So, yeah, she's a good fit for La Salle. "Alyson is going to be her own player for us, but I feel like she will take on a big scoring role," Wedin said. "We've already taken some of the same mini-sets that we ran for Taycee and run them for Alyson and she has fit seamlessly into that role. "She'll run the point guard position for us when we need her to, and we can have her play off the ball if we need her to score more. She's a dynamic player, so I'm thrilled to have here and she's a great kid. And she's smiling and she seems like she's having an awful lot of fun, which warms my heart. It really does." Because La Salle Prep is a private school and actively recruits prospective students, Miura's arrival has people wondering if Wedin or someone else on her staff wooed Miura away from Clackamas. No, Wedin said, that didn't happen. She and her staff were among the last people on campus to know that Miura was ready to transfer. "I remember it was a Monday morning and we were coming back from an AAU game and I was like, 'What!?' It was like Christmas in May. That's exciting when you get an elite-level athlete joining your program. It just is, especially one that I already have a relationship with and I know will thrive in our program." That's the draw — a program that features an exciting brand of basketball and is consistently in the hunt for state titles. Kids who are competitive by nature are drawn to that, regardless of the sport. "We just try to build a program that is healthy and successful, and kids thrive here and they enjoy it and they love it," Wedin said. "I think other kids, when things maybe don't work out somewhere else or it's just not a good fit for them and basketball is a big piece of their life, then our program makes sense. "It's not rocket science. I mean, our brand is out there. This is how we play. If you watch us play, it's sincere, it's genuine, and my kids enjoy each other, they enjoy the game, and us coaches love our kids. I think some kids want to be a part of that and I don't think there's anything wrong with that, by any stretch." When high-caliber athletes transfer, one school's game is another school's loss. There is no question that Miura's departure has left an unexpected hole in Clackamas' lineup, but the Cavaliers, like Miura, have moved on. "It's not the first time that we've had an unexpected shift in personnel," Cavaliers coach Korey Landolt said. "Looking forward, I'm just excited about the group that I have. I like the attitudes that these kids have and I've never seen a group work so hard. "I'll take a bunch of kids that are excited for each other and want to get after it on defense and are excited about showing up every day." Clackamas graduated five seniors including three starters from last year's team that went 24-5 and lost in the 6A quarterfinals to eventual state champion Southridge, so the Cavaliers already had some retooling to do before next season. Losing Miura makes that job a little more complicated. "It's always a weird situation when somebody transfers," Landolt said. "I'm sure if we were to get a great transfer coming in this summer, it would be weird for that other coach, too. It's like, 'OK, now we've got to figure something else out,' which, so far, I feel like we are figuring it out." In some cases, athletes switch schools to try and improve their stock as college prospects, but Miura's stock was already pretty high, so that wasn't what was behind the move. Yes, she expects her time at La Salle to help prepare her to take the next step as a student-athlete, but if things unfold this summer the way she hopes, it's possible that she will sign a National Letter of Intent to play college basketball before the Falcons play their first game of the 2018-19 season. Miura is scheduled to play in several upcoming college viewing tournaments with the Cal Stars, including stops at the June 29-July 1 End of the Trail Shootout in Oregon City; the July 6-8 Run 4 the Roses EYBL Tournament in Louisville, Kentucky; the July 10-12 Nike Nationals in Chicago; the July 23-25 EOT Bay Area Challenge in Rocklin, California, and the July 27-20 EOT Summer Swoosh Championships in Ladera, California. Miura then plans to take some official college visits in August, but said it's too early to know for sure which schools will make her short list. "I'm really not sure what I'm doing yet and it has been a little stressful, but I'm also super-grateful that I have this stress and I have options," she said. "There are some schools that I talk to more than others, but I'm still pretty open and waiting to see if I get anyone new." The early signing period for high school basketball players begins Nov. 14. "I'm guessing I'll probably know where I'm going by then, hopefully," Miura said. "I think most basketball players kind of know by then and sign in that early period, but we'll see."